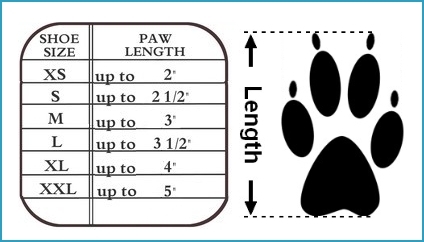 Meshies are ideal to protect paws from heat, and aid dogs who need added traction on indoor slippery floors. Simple as can be - these booties slip right on and stay on! You can now rest easy knowing that your pet is safely protected from hot asphalt, sand and any other summer season irritants. Perfect to wear indoors after surgery, to prevent continual scratching or licking due to allergies, or to protect brand new wood floors. Also great for elderly dogs or dogs with arthritis who need added traction. The strap is elastic - be sure not to fasten to tightly to avoid cutting off your dog's circulation. Mesh material is breathable and perfect for protection on a warm summer day. My pup is 13 years old and her legs are not what they used to be. Bought winter and spring non-slip booties. They are great both indoor and outdoor. These boots are great and my dog doesn’t mind wearing them at all. When I had a problem with one of the boots, I emailed a photo and they send me a replacement boot immediately. I highly recommend this product as well as the company. The meshies are a good fit and style for my sport dog. He is always coming in and going outside.They are easy to put on,and they will stay on the foot. I do recommend this dog bootie. We are on a second pair. Seem to fit fine. Has only worn them once. Still getting use to walking in them. Great experience with your company and easy to order on line!